Scotts® EZ Seed® Patch & Repair Sun and Shade is a revolutionary seeding mix that guarantees seeding success*! The unique combination of Scotts® high performance seed, premium continuous release lawn food, and super-absorbent growing material, makes it possible for grass to grow anywhere, guaranteed. 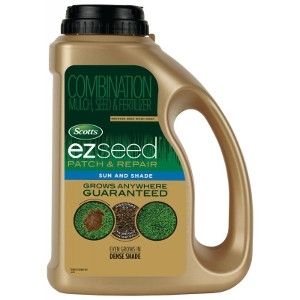 * Scotts® EZ Seed® now has a tackifier to reduce seed wash-away on sloped areas of your lawn! *Subject to proper care.